ooh neato: Marvel Avengers Alliance: Captain Britain is Now Available for Recruiting! 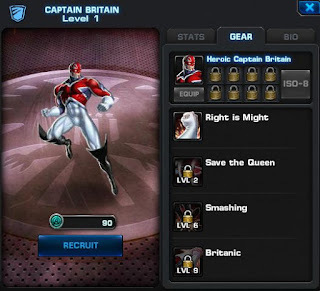 Marvel Avengers Alliance: Captain Britain is Now Available for Recruiting! Marvel Avengers Alliance now has Captain Britain available to recruit (although they haven't released the patch notes for him yet). • Attacks against this target have a chance to grant an Extra Turn and restore health. Captain Britain is a offensive Bruiser a la Hulk. Smashing is too powerful, while it has a long cool down, low damage, and high stamina, it essentially grants your team a free turn. Combine this with the fact that Captain Britain already has a chance of gaining free turns and the mechanic is rife for abuse. I like this your posting. cant you visit here please.